Astakos is GRNET project that provides identity management, catalog and policy services. It is designed to be used by the synnefo family software, but is free and open to use by anybody, under a BSD-2 clause license. Astakos serves as a unique point of authentication for GRNET cloud services. It is a platform-wide service that allows users to manage their accounts. It extends the snf-manage command line tool by introducing commands for managing the user accounts. 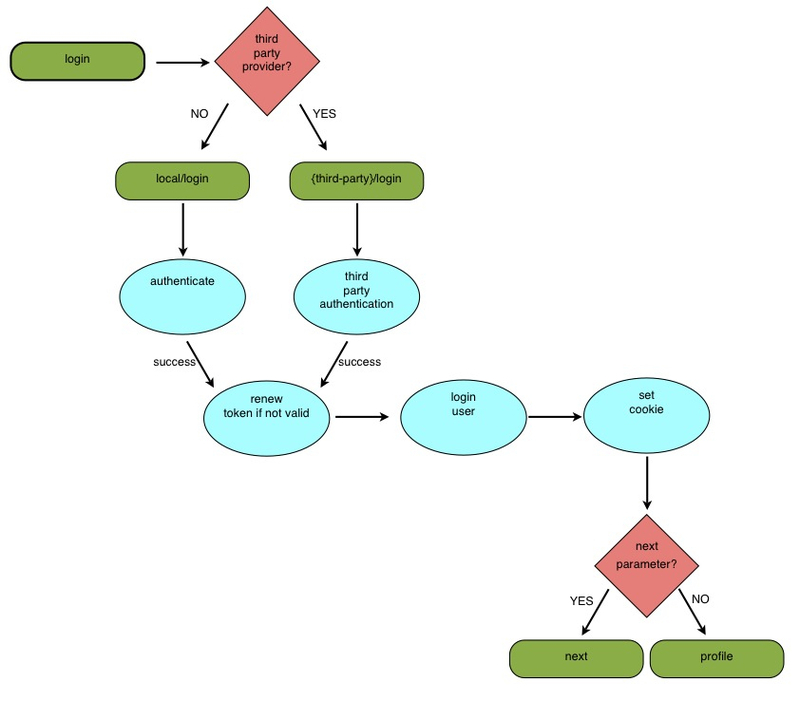 It is build over django and extends its authentication mechanism. present the overall architectural design. The present document is meant to be read alongside the Django documentation. Thus, it is suggested that the reader is familiar with associated technologies. 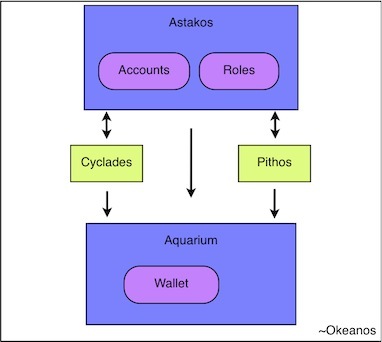 Astakos service co-ordinates the access to resources (and the subsequent permission model) and acts as the single point of registry and entry to the GRNET cloud offering, comprising of Cyclades and Pithos subsystems. It also propagates the user state to the Aquarium pricing subsystem. Invitation feature is currently disabled. A registered ~okeanos user, invites student Alice to subscribe to ~okeanos services. Alice receives an email and through a link is navigated to Astakos’s signup page. The system prompts her to select one of the available authentication mechanisms (Shibboleth, local authentication) in order to register to the system. Alice already has a Shibboleth account so chooses that and then she is redirected to her institution’s login page. Upon successful login, her account is created. Since she is invited her account is automaticaly activated and she is redirected to Astakos’s login page. As this is the first time Alice has accessed the system she is redirected to her profile page where she can edit or provide more information. Tony while browsing in the internet finds out about ~okeanos services. He visits the signup page and fills the signup form. Since his not an invited user his account has to be activated from an administrator first, in order to be able to login. Upon the account’s activation he receives an email and through a link he is redirected to the login page. Alice requests a specific resource from a cloud service ex. Pithos. In the request supplies the X-Auth-Token to identify whether she is eligible to perform the specific task. The service contacts Astakos through its /account/v1.0/authenticate api call (see Authenticate) providing the specific X-Auth-Token. Astakos checkes whether the token belongs to an active user and it has not expired and returns a dictionary containing user related information. Finally the service uses the uniq field included in the dictionary as the account string to identify the user accessible resources. Responsible for handling the account registration and activation requests is the signup view. This view checks whether it is a request for a local account. If this is not the case, the user is navigated to the third-party provider to authenticate against it and upon success is redirected back in the signup view. If the supplied information is valid and an inactive account is created. Then the appropriate ActivationBackend handles the account activation: the InvitationsBackend if the invitation mechanism is enabled and the SimpleBackend otherwise. In the first case, if the request is accompanied with a valid invitation code the user is automatically activated and since its email address (where received the invitation) is verified, acquires a valid token and is logged in the system. If there is no invitation associated with the request, the system check whether the email matches any of the ASTAKOS_RE_USER_EMAIL_PATTERNS and if it does it sends an email to the user to verify the email address, otherwise the system sends a notification email to the administrators and informs the user that the account activation will be moderated by them. If the invitation mechanism is not enabled, the SimpleBackend checks if the email address matches any of the ASTAKOS_RE_USER_EMAIL_PATTERNS or the moderation is not enabled and it sends a verification email, otherwise informs the user that the account is pending approval and sends a notification email to the admins. The verification email contains a link that navigates the user to activate view through a URI that contains also a temporary user token. If this token is valid the user account is activated and the user is logged in the system, after renewing the token and setting the cookie identified by ASTAKOS_COOKIE_NAME (used by the ~okeanos subcomponents). If FORCE_PROFILE_UPDATE is set, after the first successful login the user is navigated first to the profile view, before been redirected to the next parameter value. During loging procedure the user is authenticated by the respective identity provider. If ASTAKOS_RECAPTCHA_ENABLED is set and the user fails several times (ASTAKOS_RATELIMIT_RETRIES_ALLOWED setting) to provide the correct credentials for a local account, is prompted to solve a captcha challenge. Upon success, the system renews the token (if it has been expired), logins the user and sets the cookie, before redirecting the user to the next parameter value. The snf-manage addterms command serves to add new approval terms. During the account registration, if there are approval terms, the user has to agree with them in order to proceed. 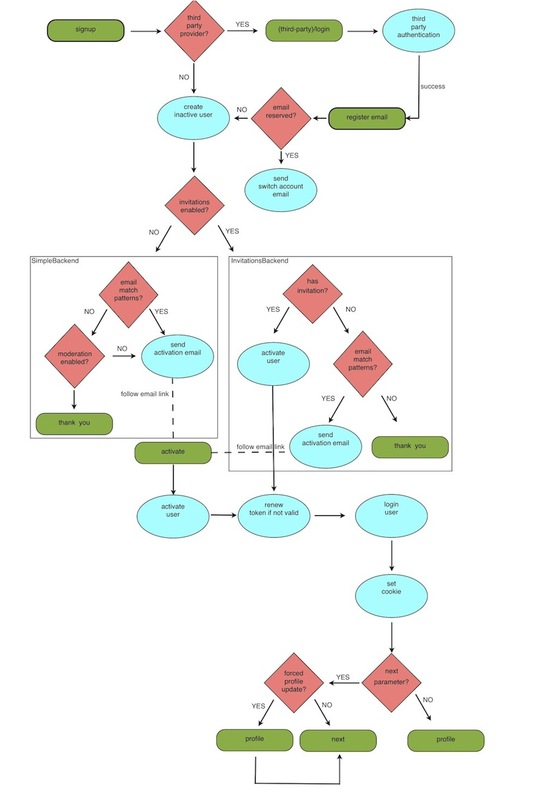 In case there are later approval terms that the user has not signed, the signed_terms_required view decorator redirects to the approval_terms view. Services (ex. Cyclades, Pithos) are registered in astakos via snf-manage registerservice. This command generates and prints a service token useful for accessing the service API. Registered services can be viewed by snf-manage showservices command and snf-manage unregisterservice can be used to unregister a service. Astakos incorporates django user authentication system and extends its User model. Since username field of django User model has a limitation of 30 characters, AstakosUser is uniquely identified by the email instead. Therefore, astakos.im.authentication_backends.EmailBackend is served to authenticate a user using email if the first argument is actually an email, otherwise tries the username. A new AstakosUser instance is assigned with a uui as username and also with a auth_token used by the cloud services to authenticate the user. astakos.im.authentication_backends.TokenBackend is also specified in order to authenticate the user using the email and the token fields. access and edit their profile via: /im/profile. User entries can also be modified/added via the snf-manage commands. Internal Astakos requests are handled using cookie-based django user sessions. External systems should forward to the /login URI. The server, depending on its configuration will redirect to the appropriate login page. When done with logging in, the service’s login URI should redirect to the URI provided with next, adding user and token parameters, which contain the email and token fields respectively. External systems inside the ASTAKOS_COOKIE_DOMAIN scope can acquire the user information by the cookie identified by ASTAKOS_COOKIE_NAME setting (set during the login procedure). Finally, backend systems having acquired a token can use the Authenticate api call from a private network or through HTTPS.